The Anzalduas Dam on the Rio Grande near Mission is shared by operators in Mexico and the United States. Following Hurricane Beulah, runoff from the storm overwhelmed several flood control projects resulting in some of the worst flooding in the Valley’s history. Since then standards have been raised, but the system has since never been tested to the flood levels seen 1967. Below are the flood-control projects in place for the Lower Rio Grande Valley. International Boundary and Water Commission officials say there are no additional projects currently under way. The interior floodway, which starts 13 levee-miles downstream from Penitas at Anzalduas Dam, is about 70 miles long and is bounded by 143 miles of levees; 68 miles on the right side and 75 miles on the left side. The Arroyo Colorado, a 53-mile natural channel that breaks-off the interior floodway, is confined by high ground and 25 miles of levee; 10.5 miles on the left side and 14.6 miles on the right side. The Lower Rio Grande Flood Control System provides protection to the following metropolitan statistical areas: Brownsville-Harlingen, Texas and McAllen-Edinburg-Mission, Texas. Approximately one million U.S. residents live in the Lower Rio Grande Valley. Due to its proximity to the Gulf of Mexico and related tropical weather systems, the Lower Rio Grande Valley is prone to hurricanes and annual flood events. Location: Near City of McAllen in Hidalgo County, 11 miles upstream from the Hidalgo-Reynosa International Bridge. Purpose: To assure the diversion of the U.S. share of floodwaters to the interior floodway, to enable diversion of water to Mexico’s main irrigation canal, and to effect releases for downstream water users in both countries. Facilities: Constructed between 1956 and 1960, Anzalduas Dam is a concrete-gated structure flanked by earthen dikes. The dam is 524 feet long and has six cylindrical or roller-type gates. Each of the six gates is 75 feet wide. The earthen dikes have a total length of 6,600 feet, 5,400 feet of which are in the United States. Operators are on duty 24 hours a day, and staff from the United States and Mexico share a single control room. Location: Hidalgo County, Cameron and Willacy counties in Texas and the State of Tamaulipas, Mexico, covering 180 miles of river from Penitas, Texas, to the Gulf of Mexico. Purpose: Flood protection for residents, businesses, and farms in the United States and Mexico. Facilities: Originally built as a system of floodways and levees in the 1930s, improvements were made in the 1950s and the 1969s, After Hurricane Beulah struck the Lower Rio Grande Valley in 1967, causing serious damage to Harlingen, the McAllen airport and other urban and agricultural lands in Texas and Mexico, the IBWC decided to build Retamal Diversion Dam to enable diversions to a new Mexican floodway. Additionally, levees were raised and floodways modified. From 1968 to 19 77, $29 million was invested in project improvements. The U.S. portion has 270 miles of levee, 30,000 acres of interior floodway, 420 drain structures, 180 irrigation structures and six bridges. Recent studies have indicated a need to raise and rehabilitate portions of the levee system in order to meet the project’s flood-control objectives. The USIBWC will design and construct these improvements as funds become available. Location: Extending for 75 miles through Tamaulipas, Mexico, from eight miles above Anzalduas Dam to the Gulf of Mexico. Purpose: To reduce the salinity of the Lower Rio Grande by conveying directly to the Gulf of Mexico the highly saline irrigation return flows from the San Juan Irrigation Project in Mexico. Facilities: Constructed by Mexico from 1966-69, the project has a conveyance channel, pumping plant and diversion structure. 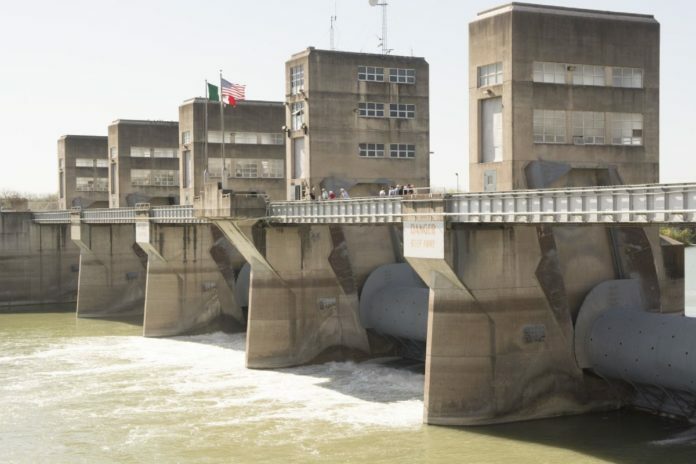 Construction, operation, maintenance and costs are shared between the United States and Mexico with the U.S. portion of costs divided between the federal government and Lower Rio Grande Valley water users. Location: Thirty-eight miles downstream from Anzalduas Dam, and 16 miles southeast of the City of McAllen. Purpose: To limit flood flows at Brownsville-Matamoros and to enable Mexico to divert to its interior floodway its share of Rio Grande floodwaters. Facilities: Constructed from 1971-75, Retamal Dam is 200 feet long with three gates and a control house at the center of the dam. The dam is operated and maintained jointly by the United States and Mexico.